My PO-35 (which I love) is a bit quiet for me when using it with headphones directly from the audio out. I usually have it at max volume, and sometimes wish it had more juice. There seems to be a way to adjust the headroom on the rear panel, but I'm not sure the best way to go about it. What impedance are your headphones? The PO's are really most suitable for low-impedance headphones like the ones you'd use for your mobile-phone etc. There is no way to go beyond BPM+16 level on the output without hardware modification. Also make sure you use fresh batteries. From PO-32 and onwards there is an output gain limiter that turns on when batteries go low to make sure the CPU is receiving enough power. You can see if the limiter is active by checking for dimmed out LEDs when you hold down BPM. Thanks for the quick response (and for an awesome product!). I've tried several fairly sensitive IEMs, so I don't think it's an impedence issue. It looks like there might be a way to adjust the gain, but I guess not. To clarify, you're saying that you can tell the output gain limiter is active when the LEDs are dimmer than normal when you hold the BPM button down? Right, those are additional speaker connections. Not sure how useful they are really. Yes, the higher numbered LEDs get dimmer than normal when the limiter is active to show that they are beyond the maximum possible level. 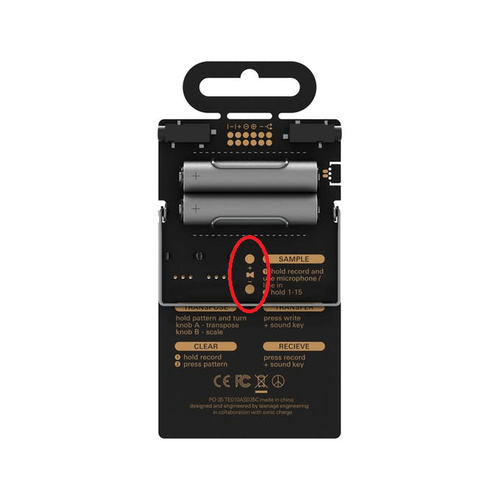 But this should only happen with really weak batteries.